When using your car every day, you don’t want to waste time plugging in and switching on multiple devices, buying a splitter or accumulating suction cups on the windscreen. Dedicated devices are often not enough to meet all your requirements. Imagine navigating, viewing the camera footage or using handsfree directly on the rear-view mirror. 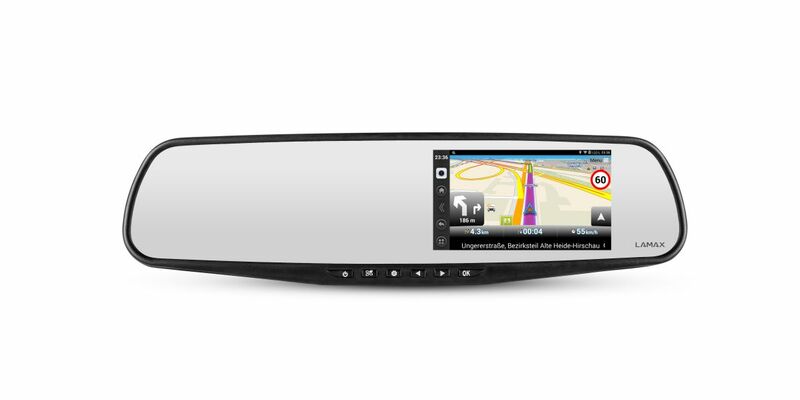 For all this and much more, we present the multimedia LAMAX S5 Navi+ running Android. Thanks to the new chipset, your footage will be even better. Forget the stress of zigzagging across town, unable to find your way. 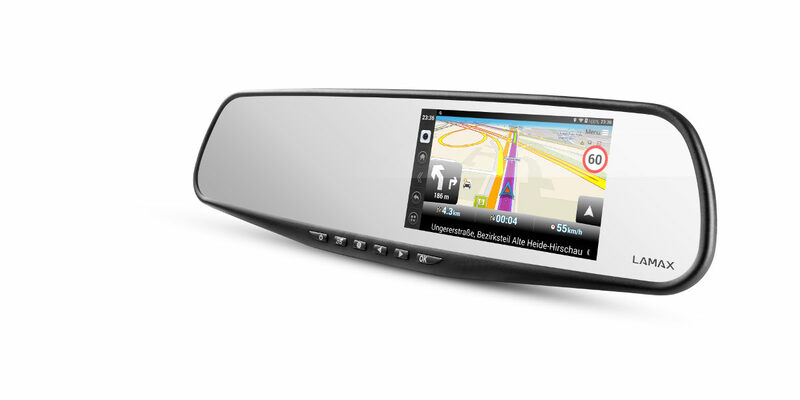 The LAMAX S5 Navi+ navigation and multimedia system never leaves you stranded. Thanks to OpenStreetMaps being constantly updated by users you will always have up-to-date information. Speed camera detection and speeding alerts protect against being fined. No matter how good a driver you are, or how safely you drive, there is no guarantee you will not be involved in an accident. There are an ever increasing number of vehicles on the road, signs are often confusing, roads are bad quality and accidents occur. In the modern world an eyewitness is invaluable. 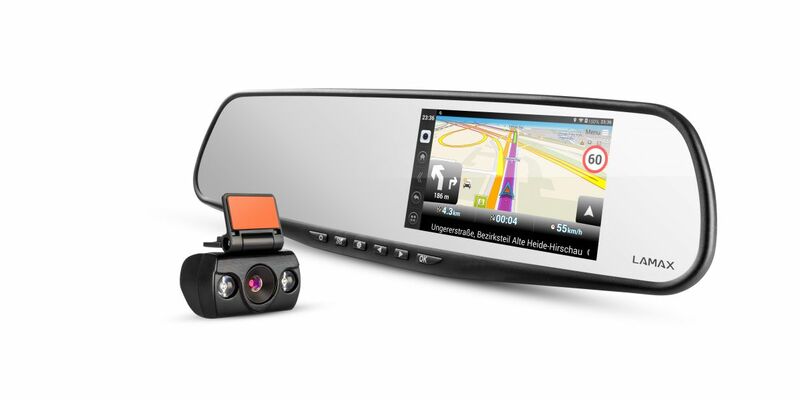 With a car camera you can save money and your driving license. Loop recording means the camera never stops recording and never runs out of space. Data lock and the G-sensor ensure that evidence of an accident is never lost. Taking calls while driving is distracting and causes traffic accidents. In most countries it is a punishable offence. The only legal option is to use a handsfree kit. 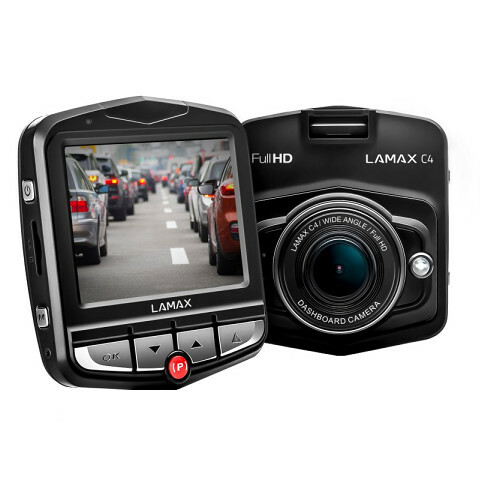 The LAMAX S5 Navi+ with its built-in Bluetooth is perfect for the job. You can upload a contact list, see recent calls and it is connected via the car radio to the speakers. What is happening behind the car is often as important as what is happening in front of it. The rear camera is connected to the mirror which allows you to not only watch what is happening behind you, but to capture it. When reversing, parking lines appear which makes parking a breeze. A car radio with a USB connector is still not standard. Some car makers ask high prices for this as an added extra. With the LAMAX S5 Navi+ you can upload several hours of music and easily connect it to your existing car radio via the FM transmitter. The wide bandwidth means you can easily find a frequency that does not interfere with reception. The 4.3 inch LCD display offers you a complete overview of what is happening around your vehicle whilst still enabling you to use navigation or play video. Operating the same as a smartphone, means that you don’t have to learn anything new. The Android operating system enables you to play a variety of games which will make time fly by. Thanks to the multiconnectivity of the LAMAX S5 Navi+ you can connect wirelessly to your phone or directly to the internet. Connect to a nearby Wi-Fi router or use your smartphone as a mobile hotspot. Easily update apps or navigation maps. Using Bluetooth you can connect to your smartphone to transfer data or set up handsfree. The basic package includes a cigarette lighter charger with two USB slots. As well as the multimedia system, this can supply a smartphone or tablet. When it comes to safety, you want the best. 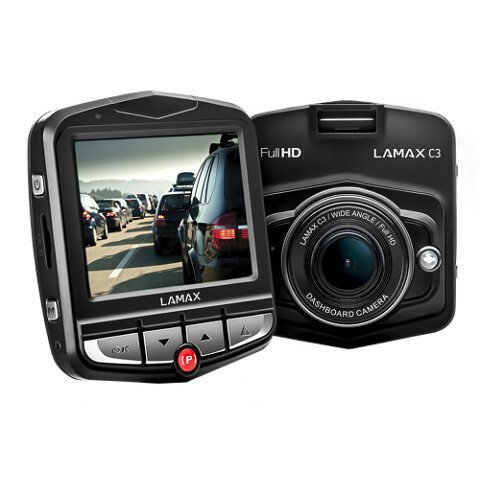 The LAMAX C9 is the best dashcam on the market. Smart features, such as oncoming speed camera alerts, will save you money for fines. The lane departure warning system also prevents danger in a moment of distraction. Plus, if an accident occurs, you will have at your disposal a crisp and clear video with a resolution of up to 2K. You can be sure the LAMAX C9 is a real asset to your travels. Thanks to its quick installation and ease of use, handling it is a breeze. Every driver wants to avoid an accident, but accidents are on the rise every year, including those with no known culprit. Do you want have proof for an insurance company that the accident wasn't your fault? 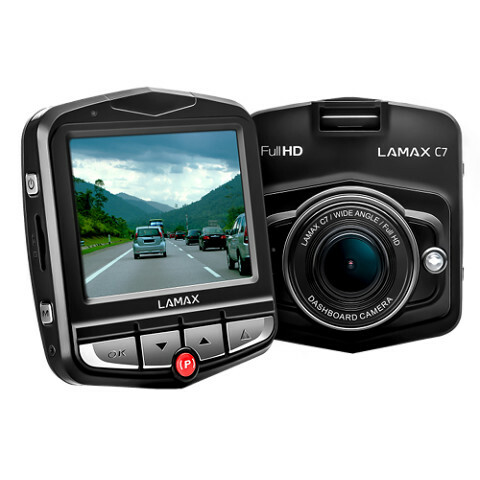 The LAMAX C7 keeps these vital records for you in high definition, not to mention its high-quality night mode, time-lapse video or parking mode. Of course it is simple to operate, thanks to its practical mount and installation, G-sensor and motion detection. No longer will an accident catch you unawares. Whether you drive tens of thousands of kilometres a year or you just pop to the supermarket once a month, with the C4 dashcam you’ll be ready for anything. Today, on our roads a car crash occurs roughly every 3 minutes. No matter how safe you drive, you can’t guarantee an accident won’t happen to you. In such a situation, a car camera is extremely useful in identifying the culprits and serving as evidence for the police and the insurance company. Although automobiles are increasingly “smarter” and safer, with accidents on the decrease, actual penalties for offences and the number of police officers are constantly growing. Total damage goes into the millions of euros annually. There is also an increasing number of incidents where the offender is unknown or the situation disputed. The LAMAX C3 camera will help resolve this. 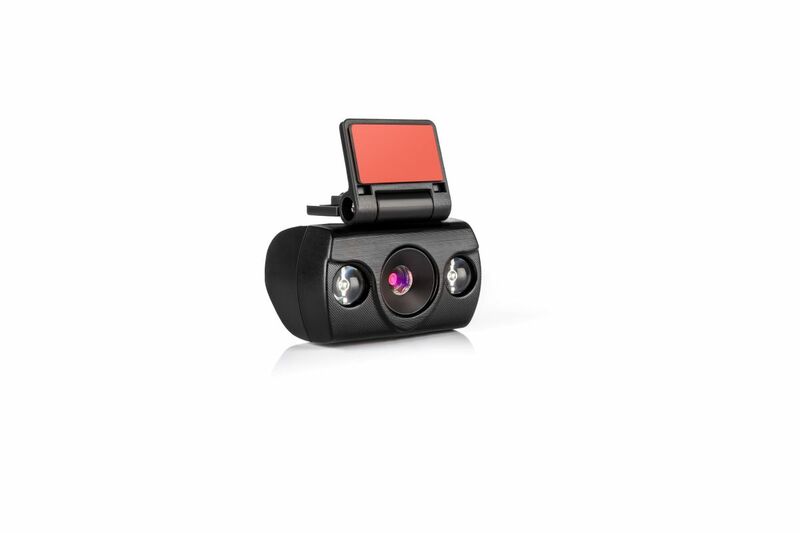 It records in high definition, with a G-sensor, parking mode and motion detection, plus a large aperture lens and LED illumination means fantastic night shots. Not only this, but the LAMAX C3 is at a great price. 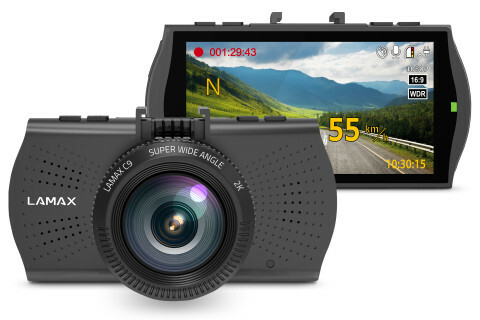 LAMAX S7 Dual dashcam, full HD resolution, 140° wide-angle lens, large 4.3" display, Multilingual menu, G-Sensor, GPS module, motion detection, recording lock, parking mode, LDWS, 850 mAh battery, possible to connect rear camera as a parking camera.